Negroni Talk #5 - 15.10.18. Negroni Talk #6 - 19.11.18. Negroni Talk #S1 - 28.01.19. Negroni Talk #7 - 25.03.19. Negroni Talk #8 - 29.04.19. Negroni Talk #9 - 20.05.19. Negroni Talk #10 - 03.06.19. Negroni Talk #11 - 10.06.19. Negroni Talk #12 - 17.06.19. Negroni Talk #13 - 24.06.19. As well as our studio space at no 10 Vyner street, we also run a Venetian bar restaurant Ombra just a few doors down at no 1. Conceived as a 'campo', a place of social/cultural exchange, it reflects many things about who we are as people and how fourth_space looks at the world. 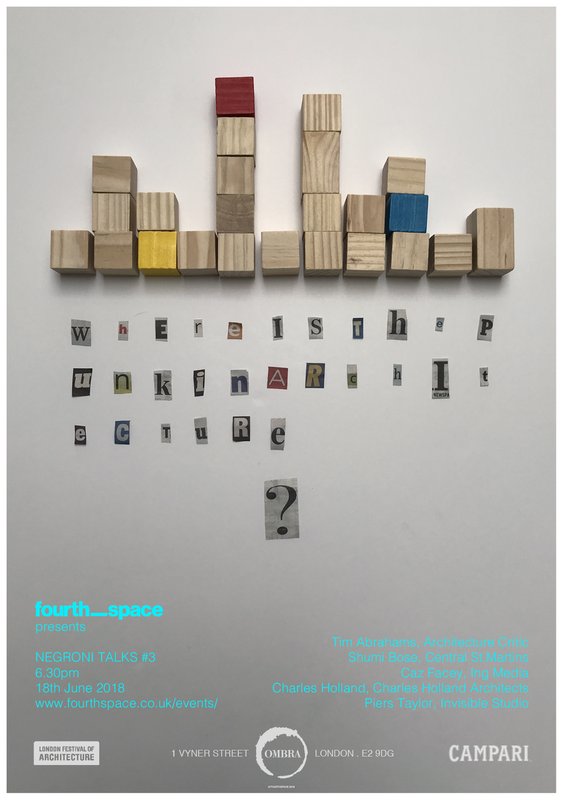 It also acts as our 'second' meeting room whilst providing the venue for fourth_space hosted events that we organise as a parallel interest to the design work of the studio. 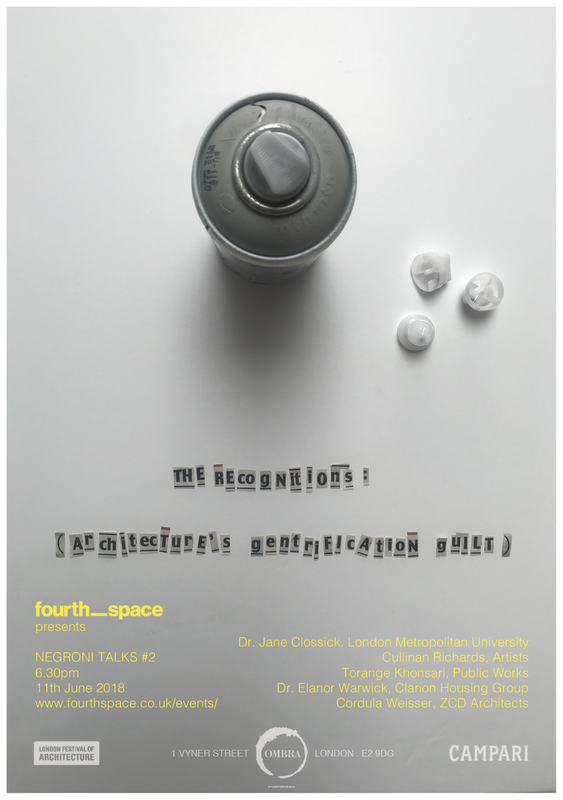 The Negroni Talks – hosted by architects Fourthspace and sponsored by Campari – were set up to capture the lively and provocative debates that took place in the European café culture of the early twentieth century. Intended to be irreverent and to break with the formality of traditional panel discussions, the series takes place in the Venetian restaurant Ombra. 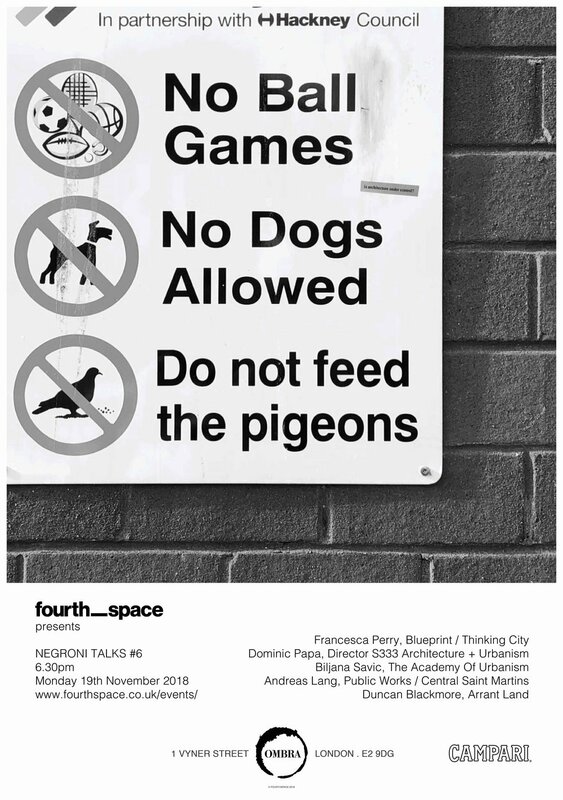 Food, drink and arguments go hand in hand, and the talks provide a ‘freespace’ for lively discussions around architecture and the role it plays in shifting the identity of places, spaces and groups. Covering a wide range of topics, the Negroni talks tackles some of key issues of the day.